Step 1 - Give our team a call. 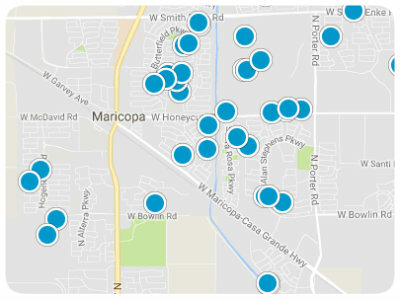 Our service is FREE and we are realty experts for Maricopa, Casa Grande, Chandler, and Ahwatukee, with over 50 collective years experience. As a broker and realtor we provide only the highest standards of support and expertise. Whether you are buying for the first time, retiring, or even buying a new builder home, the main steps remain the same. What comes next once you have a property in escrow? First, enjoy the moment! This is a very big step. Real estate is absolutely one of the most important things you will purchase because it is an investment, a place to live, a tax shelter, and most importantly, a home for you and your family. It's a place to raise a family, host friends, prep a baby room, walk kids to school, build a pool, wave to neighbors, enjoy retirement or a new marriage and building a life together. Your 10 day inspection period begins, during this time you are encouraged to fully inspect all aspects of the area, neighborhood etc.Also during this time we will order your home inspection and schedule a time for you to meet up with the inspector. Get the property appraised. This will be scheduled by our team. Get keys, hugs, handshakes, and start the next phase of your life! Ultimately, buying a home should be fun and rewarding. Yes, there may be stressful things that will come up. That is why choosing your real estate broker is so important. Experience MATTERS and buying a home isn't something you trust to a part-time agent or family member who has a license but has only done a handful of transactions. Hire and the expect the best. Create a relationship you can trust today and for all future family and friends transactions.